A Summer Family Vacation in the Greek Isles. Why Not? Ever dreamed of vacationing in Greece? Now is the time to take action. The dollar to euro ratio is nearing par so a family vacation in Europe is much more affordable than in previous years. I have been researching vacation options feel compelled to pass on an exceptional website, Kids Love Greece, founded by three moms, one wanna-be mom, and supported by more than 100 families living in Greece. Crete family vacations always include stories about Zeus, the Minotaur, Daedalus, and of course Icarus. Their clever, authoritative effort showcases more than 250 kid-friendly ideas for vacationing in Greece. Browse the site and be inspired by delightful images conveying a sense of place and be entertained by unique ideas from parents for parents. Really, if you are not Greek by heritage, you will want to be once you peruse the site. The good thing is that in addition to suggestions and advice Kids Love Greece has a selection of vacation packages designed to make travel easy. 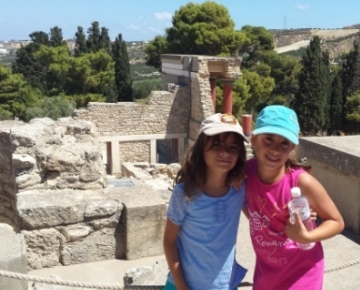 Better yet, to involve little ones they have created an audio guide “Kids Love Knossos” application as a useful companion to a family vacation on Crete. The storyline features Palace of Knossos on Crete and features Glaucus and his little sister Phaedra, the sweet time-travelers of Kids Love Greece, as they travel back in time more than 4000 to the time of the Minoans. Rent a car if you wish and explore or join a tour and relax. There are gorges to be walked, archaeological sites to visit and history to absorb, fun parks to discover, water parks to enjoy, go-karts to race, donkeys to ride, wonderful scenery to enjoy, and all too tempting dining possibilities. I am dreaming of olives, Athena, and the Aegean. Nancy Nelson-Duac Curator of the Good Stuff for the Family Travel Files.